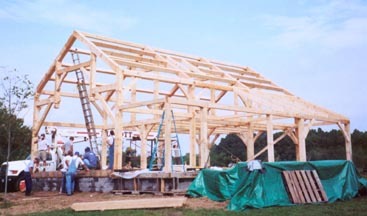 If you are thinking about building a home, barn, workshop, outhouse or any type of building and want it to be a timber frame. Grand Oaks Timber Framing can make it happen for you. Tell us your plans, show us your drawings, share your vision with us and we will work with you to make it a reality. If you have your own plans, we can work with those. There are also standard timber frame designs, of many different sizes, we can cut from or we can help you custom design your own frame. Contact us at (731) 707-0742 or scott@grandoakstimberframing.com and let us cut that frame for you! Thrilled with Scott's work on our frame. It's not to many times that you feel "over delivered" in today's world. However that is exactly what I experienced with Scott's work. Frame is great and the assistance in construction was fantastic as well. For any of you looking for a straight deal, Scott would serve you well.